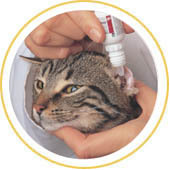 Otitis Externa infection of the external ear canal, and Otitis Media, of the middle of the ear, are usually caused by ear mites, bacteria or yeast. Other possibilities include injury to the ear, debris, or a foreign object in the ear canal. When seeking treatment, act quickly. This disease causes considerable discomfort to cats. Antibiotics can be used to fight the infection. Ear Mites are common parasites that are highly contagious, often contracted from pet to pet. Excessive itching is the first sign, and they create dark, crumbly debris that looks like coffee grinds. Hematoma of the Ear Flap means blood has accumulated in the ear flap. 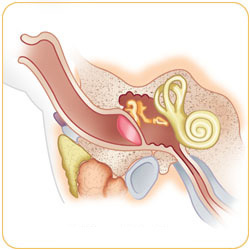 Vigorous head scratching, shaking, or trauma can result in damage to the blood vessels in ears. Deafness, usually caused by old age, trauma, loud noise or infection, can also be hereditary or congenial. Unfortunately, there is no cure for deafness, and is a lifelong condition. Read the label instructions carefully for the correct dosage. Pull the ear flap backwards over the head, squeeze out the recommended amount, and apply it to the lowest part of the ear canal. After, gently massage the ear to help work the medication into the ear. Important – Always give the amount of mediation that is either given by the veterinarian or on the bottle. When giving medication, stay calm, as your cat can detect if you are nervous, and will act nervous themselves. Always praise good behavior with a treat.